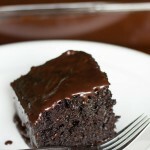 These are some of the best and most decadent brownies I’ve ever made! 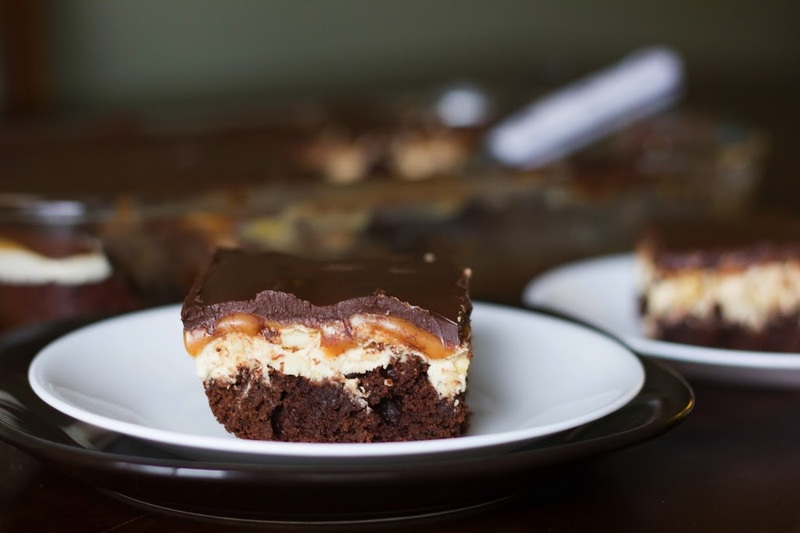 I started with layer of slightly cake-like, not overly rich brownies, and topped that with homemade peanut butter nougat, a caramel layer, and a chocolate-peanut butter layer! And guess what? It really does taste like a Snickers candy bar…except better =). They are slightly time consuming because you have to wait for each layer to cool before you can add the next layer. It works out though, because this way you have time to do the dishes while you wait for each layer to cool. A little goes a long way with these brownies, so you might want to invite some friends over and share…or not ;). Enjoy! 2. Melt butter in large microwavable bowl. Whisk in cocoa and oil until smooth. Stir in sugar. Add eggs, one at a time, stirring well after each addition. Stir in vanilla. 3. Combine flour, baking powder and salt; gradually add to cocoa mixture. 4. Spread into a greased 13-in. x 9-in. baking pan. Bake for 25-30 minutes or until a toothpick inserted near the center comes out clean. Cool completely. 1. Melt butter in a saucepan over medium heat. Add in sugar and milk, stirring until dissolved and bring to a boil. Let cook for 5 minutes, stirring occasionally. 2. Add in fluff, peanut butter and vanilla, stirring until smooth. Turn off heat and fold in peanuts, then pour over brownie layer. Let cool completely. 1. Combine ingredients in a saucepan over low heat. Let melt, stirring occasionally, until smooth. Then continue to cook for 4 minutes more. 2. Pour over nougat layer and let cool completely. 1. Melt ingredients together in a saucepan or microwave, then pour over caramel and spread until even. Let cool until hardens slightly.